An intimate presentation of miracles for lovers of great magic! 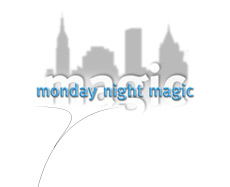 Contact us at Monday Night Magic regarding questions about the show or to book some of your favorite performers from Monday Night Magic for an upcoming event. To join our e-mail list and be kept up-to-date about all of the weekly happenings at Monday Night Magic, please click here and follow the directions.